Kaibito Creek is lengthy seasonal stream that crosses the largely flat Kaibito Plateau in north Arizona, just south of Lake Powell. 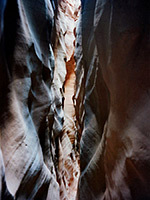 The lower (northern) section flows through a canyon that is deep but relatively wide, however about one mile of the upper creek (20 miles from the lake) is a slot canyon, extremely dark and narrow in places and very exciting to explore, though a vertical drop of at least 15 feet quite close to the start puts an end to easy progress; below this the canyon becomes quite dark, so ropes and a torch are needed to progress further. The narrow part of the canyon is itself at the foot of a wider gorge for most of the way and so it is generally rather gloomy, receiving little direct sunlight, but still with many pretty, colorful passages and swirling rock formations. The upper narrows of Kaibito Creek can be reached by first driving along a bumpy track that branches north from road AZ 98, one of the many dirt tracks that cross the Navajo Reservation. The track is generally good though may on occasions be partly covered by wind-blown sand, which may cause problems for some vehicles if not cleared. The route crosses rather featureless land of dunes and sparse grass, passing grazing cattle and occasional signs of habitation. The creek runs out of sight to the west but becomes as close as 1/4 mile after 5 miles along the road, at which point there are two short sandy side tracks that converge at a water trough, a focal point for the local livestock. 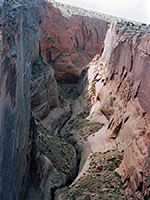 The canyon of upper Kaibito Creek is a short distance downhill past the trough; here it is sheer-walled, and about 50 feet deep and 40 feet wide. The are no immediate routes down to the streambed, but after walking downstream for 1 mile along the rim there is a diagonal cleft in the cliff walls that allows easy access to the sandy canyon floor. 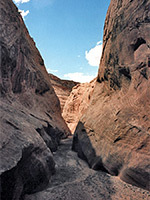 A hiking and/or camping permit is needed for all explorations of Navajo land, however Kaibito Creek is officially closed, with no access allowed, because of incidents when hikers required assistance after accidents in the canyon - the local Navajo people were naturally unwilling to be involved in frequent rescues. This closure has been in effect since 1998. Downstream of the suggested entry point the canyon remains wide and sandy for a little way longer but becomes narrow and rocky as the slot canyon begins; this deepens to about 20 feet at first, with a long straight section, often so narrow that one has to move sideways. In places the bottom of the canyon is V-shaped; the walls meet at a sharp point, which makes footing difficult and further hampers progress. Eventually the slot becomes slightly wider but also deeper and darker, although at one point a short open stretch allows the sun to fully illuminate the boulder-strewn floor. Generally, the light is not good for photography owing to the north-south orientation and the narrowness of the canyon. After only about 1/4 mile there is a sudden two-stage vertical drop of at least 15 feet into a dark passageway, which is as far as regular hikers can progress. However, it is possible to follow the creek downstream at rim level for a few miles - one can walk above the narrows for a while (at many places they are narrow enough to jump over), and then climb up the west rim of the wider upper canyon to the flat lands above. The terrain is very sandy and barren - the epitome of a desert scene, with soft dunes, wind-rippled sand patterns and scattered cacti. 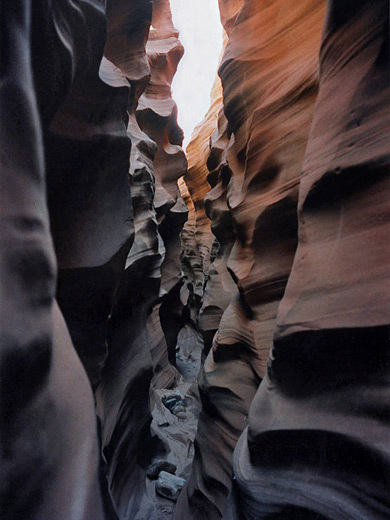 The canyon profile changes markedly before during and after the slot, from a shallow though still sheer-sided gorge, through the lengthy narrows, to a much deeper canyon contained within sheer walls 1,000 feet high. It is more than a little alarming to look down from the rather unstable sandy ground along the edge, such is the precipitousness of the abyss below. A short distance downstream, the end of the East Fork of Kaibito Creek is clearly visible - a deep narrow gash in the cliffs opposite, with a circular pool of water in the canyon floor directly beneath. 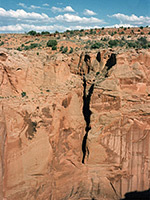 Other slots, interspersed with higher dryfalls, can be found in several places further down the canyon towards Lake Powell.